Designed for travelers who prefer a personalized experience, this private day trip showcases the magical highlights of Sintra and Cascais. Included on your itinerary, which can be customized according to your preferences, are the Palace of Quelez, the UNESCO-listed Pena National Palace, and Cabo da Roca, Europe’s westernmost point. See, too, the historic center of Sintra and explore the elegant fishing village of Cascais, home to gorgeous beaches and palaces. Hotel pickup and drop-off are included. Tick off Sintra highlights such as the Palace of Quelez and the UNESCO-listed Pena National Palace. 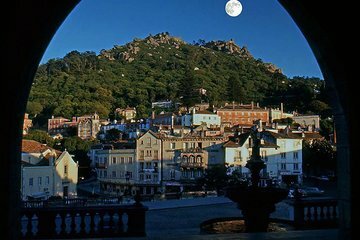 At your Lisbon hotel, board a private, air-conditioned vehicle destined for the fairy tale landscapes of Sintra. During the drive, your guide provides a historical overview of the area. Your first stop is the Palace of Quelez, the summer residence of the Portuguese royal family, where you’ll spend some time admiring its beautiful interiors. Then, after ascending the forest-shrouded side of Sintra mountain, you’ll arrive at the UNESCO-listed Pena National Palace—a Renaissance jewel enshrouded in pastel pinks and lemon yellows. Following a tour of the Romantic landmark, explore Sintra’s UNESCO-listed historical center and purchase lunch at a restaurant recommended by your guide. Proceed to Cabo da Roca, a rugged cliff considered Europe’s westernmost point, and gaze at the crashing waves of the Atlantic Ocean. Then, you’ll discover the elegant fishing village of Cascais and visit the gardens surrounding the Casino of Estoril before drop-off at your Lisbon hotel.